Race like a pro with the Playseat® TV Stand - PRO! Enhance your sim racing set up with this stylish Playseat® TV Stand - PRO. Playseat® has all the accessories to make it possible for you to race like a pro at home, including this silver TV stand on which your TV can be mounted for the perfect height for playing racing games. With the Playseat® TV Stand - PRO-3S you can expand the TV stand to three screens. My new TV stand Pro gave me just that extra Sim-Race feeling. Top quality and Fast Service, also easy to build. The day i used it for the first time i set 3 world records @ Project Cars. My Playseat TV Stand Pro is ideal for my racing rig and space in my theater room. Very sturdy stand and all of the hardware I needed to attach my Acer Predator Z35 monitor was included. The folks at Playseat Store were prompt and cordial in answering my questions. My order arrived on time as promised. I couldn't be happier! Playseat stand is built solid. 34" curved monitor mounted without issue. Cost was a bit high but not out of line with other stands. Ordered on a Thursday and arrived on the following Tuesday in the US. I used to play while streaming on my TV on the wall but I couldn't get the good feeling of being inside the car, since the TV was so far away. I already owned a WRC Playseat chair, and I recently purchased the TV Stand pro for my new 35" ultra-wide monitor. The difference is stunning. All games feel brand new. With the TV stand, I can get the monitor as close as the back of the steering wheel. The immersion is so amazing, I'm starting over all my games, just to appreciate the new driving experience. I like the TV stand pro so much, I just ordered the extension for a 3 monitor setup. Having the possibility to extend my existing rig is pretty interesting, as I don't have to replace the TV stand entirely. Good work Playseat, now the only thing missing is an articulated keyboard/mouse tray to attach to my TV stand! The monitor stand was built very well. It is sturdy easy to put together with good instructions. Super fast shipping arrives quicker than I thought. All products good quality good instruction easy to assemble . I would recommend them to my friend. I will buy from them in the future. Very solid construction and easy to assemble. 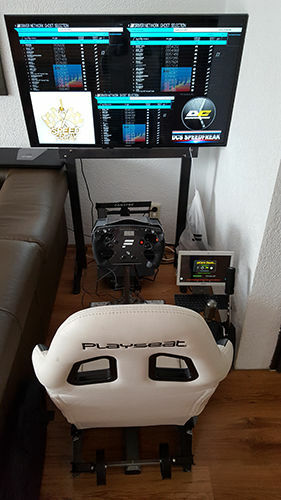 From what I could find, there are no other TV stands on the market that suit the purpose for my PlaySeat F1 so this leaves it in a class of its own. It can accommodate a wide range of TVs out of the box. For my setup, I mounted a tilting wall mount on the stand and then the TV onto the mount. That extra 10 degrees of tilt range makes for a perfect viewing angle. Also, there is ample space on the feet to stick felt pads to protect a wooden floor. Overall I highly recommend this stand. When I was ordering a play seat for my son I wondered whether to get the Tv stand or not. I am glad we did. It is well made, easy to put together and goes together with the seat to complete our simulator. We have fitted a 32" Tv on it. My son is now addicted to Dirt4!! 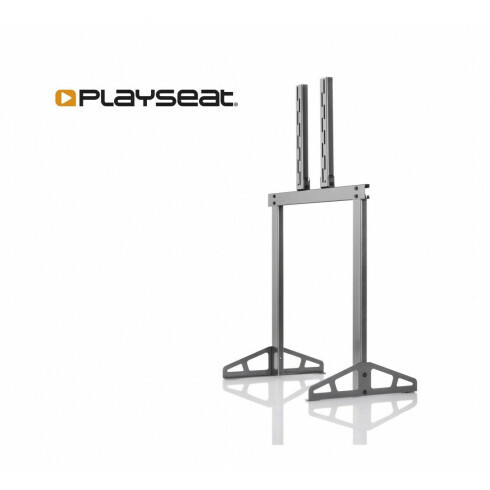 We love the playseat stand. It was easy to set up, and easy to bolt the TV to it. Seguro, equilibrado, fácil de instalar e usar, gracioso e leve no design... proporciona horas de imersão na realidade do jogo... e dá prazer em partilhar com os espantados amigos amantes de corridas de carros. This TV stand looks great and professional! It is a bit expensive but it is well worth it to go along with a Playseat.